This post is about two recipes I made recently that turned out exceptionally well. The first was a dinner made perfectly for a sunny, warm evening spent on a deck with a grill. The evening was cooling down after a record hot day and Michael had biked home from work. I got home from the gym and we relaxed outside with a glass of wine while it cooked. 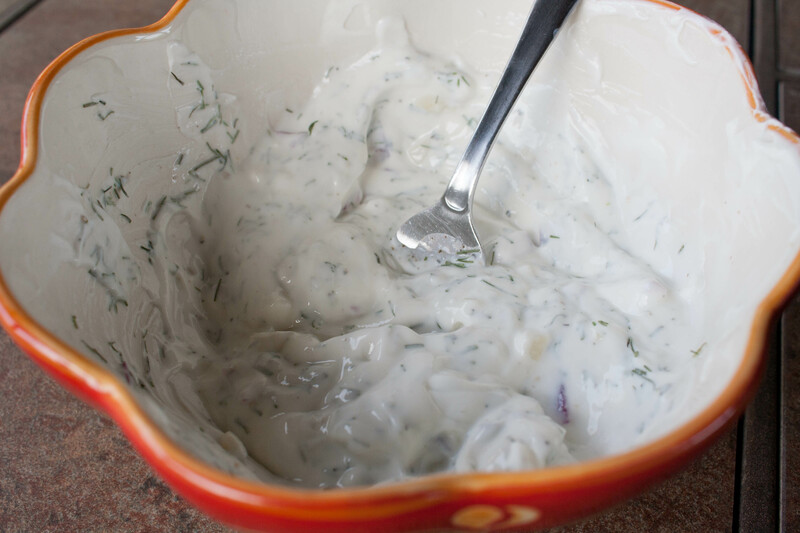 The side dish, Creamy Dill Cucumber salad, was really quick to make, kind of a lazy man’s tzatziki sauce. I halved the recipe since I only had one cucumber (although it was a very large cucumber so….it might be pretty close to the recipe). Either way, my calculations make it about 160 calories for Michael and I splitting half the recipe. Place cucumber slices in a colander over a bowl and sprinkle with salt and toss, let sit for ~20 minutes or until they lose some of their water. Remove cucumbers, squeeze and blot dry with paper towels. 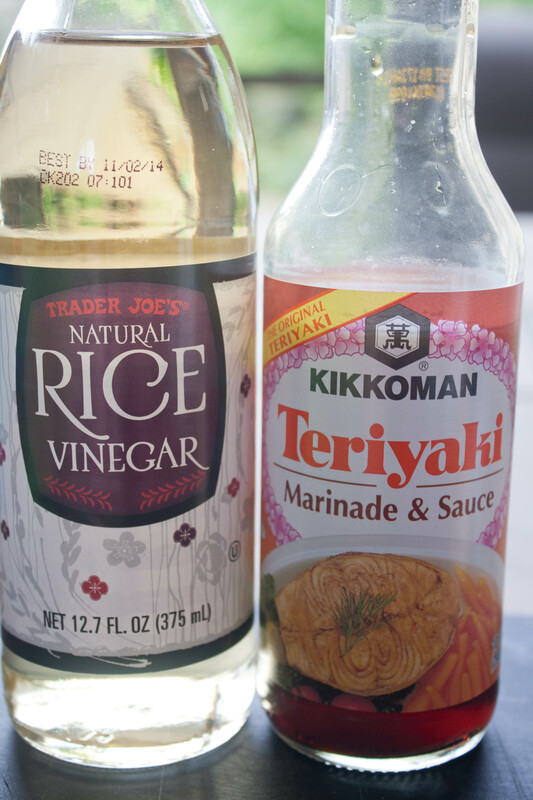 In a large bowl, mix sour cream and vinegar until combined. Stir in red onion, garlic and dill. Add cucumbers and stir to combine. Season with black pepper to taste (optional). I didn’t follow the directions exactly (it would help if I read the instructions first, right?) and skipped the step with the salt and cucumber. Oh well! It didn’t seem to matter. The cucumber salad was delicious and not soggy at all. I’d been marinating some chicken thighs in a store-bought lemon and herb marinade and even though it was store-bought, it turned out to be really, really good. I was happy with the end results. I definitely prefer to make my own marinades (and I’m pretty good at it) but this one was just fine and good for a work night when I didn’t have much time. 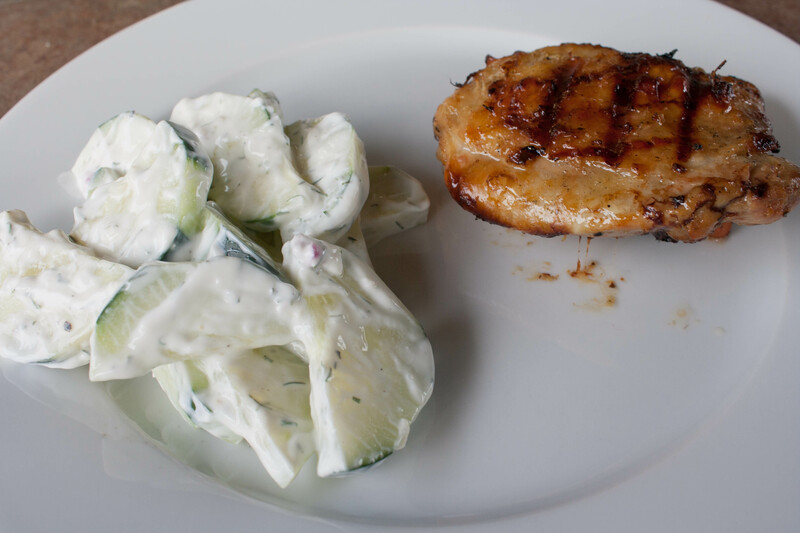 The cucumber salad went well with the lemon chicken. I think next time I’ll try it with plain Greek yogurt. Michael and I split the whole cucumber salad and it was delicious! Definitely staying in the rotation for this summer. The second recipe was a crockpot recipe I found on a food blog. I had some frozen pork chops (from Costco) that had been cut in half so I used 4 thin pork chops instead of the 6 thick ones the recipe called for. Grease crockpot or use a plastic liner. Place pork, bell peppers,broth, teriyaki sauce, rice vinegar, red pepper flakes and garlic in cooker. Cover and cook on low setting until pork is fork tender, 6-8 hours. Remove pork from cooker and coarsely chop. Add peanut butter to liquid in cooker; stir well to dissolve peanut butter and blend with liquid to make the sauce. 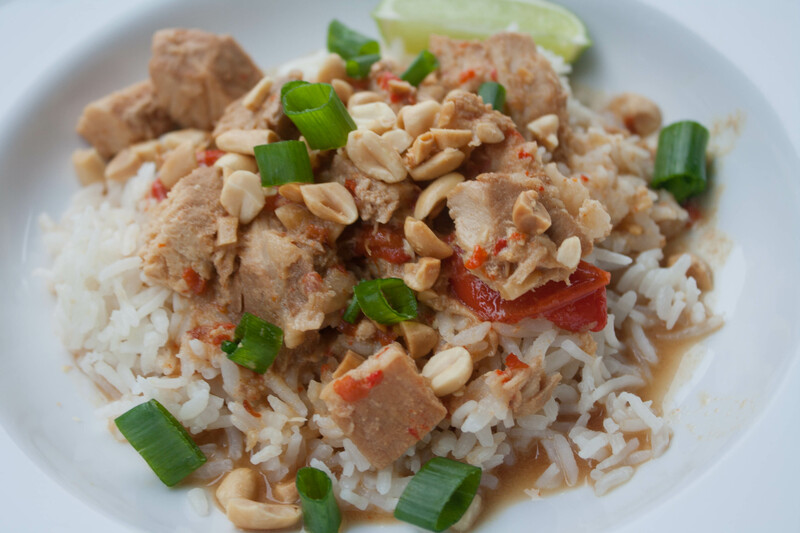 Return pork to sauce and toss to coat the meat. Serve in shallow bowls over hot rice. Sprinkle with green onions and peanuts. Pass lime wedges, to serve with this wonderful dish. It took about 15 minutes to throw everything in the crockpot and just let it do it’s magic. I did this one on a Sunday and spent the rest of the rainy day catching up on some TV shows while it cooked. I checked on it periodically and had some doubts about the pork. It was starting to look a little overcooked but I decided to just wait and see. About 30 minutes before it was going to be done, I shredded the pork, added the peanut butter and then mixed the pork back into the sauce. The sauce thickened up nicely with the peanut butter and it smelled great! I started the rice cooker with some jasmine rice while I finished things up. I LOVED the flavors. The peanut butter was not overpowering and it wasn’t too spicy (next time I’ll add more red pepper flakes). 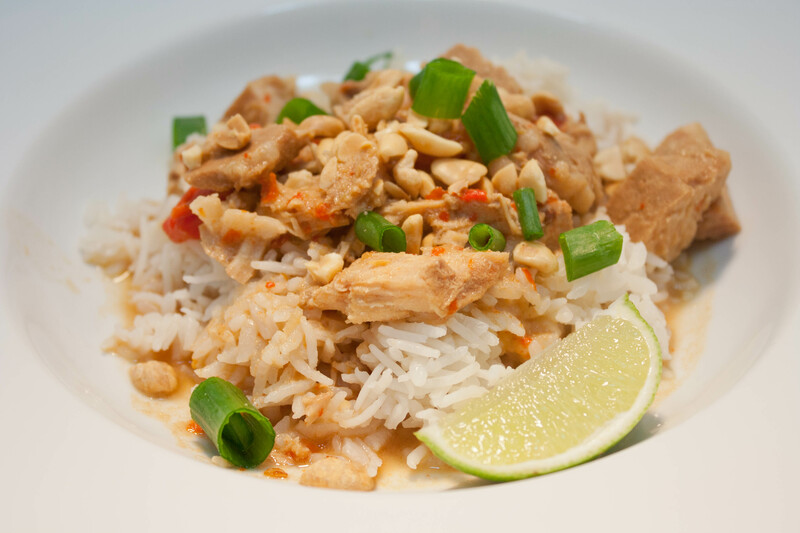 I topped the dish with crushed roasted peanuts, green onions and drizzled some fresh lime juice on it. Everything went together perfectly. I loved how the peanut topping added some crunchiness to the meat. The red peppers were pretty decimated by the time the dish was done cooking. I might add them later in the process next time just so they don’t get so mushy. Michael loved this recipe. It’s definitely the kind I would make for a dinner party. Using 4 thin pork chops got me about 4.5 servings total. I had leftovers for lunch the next day and it still tasted great. The pork wasn’t dried out like I had worried it would be. It could definitely be done with chicken, too. Both of these recipes were winners! I hope you give them a try. I’ll take both dishes please! I love cucumbers in the summer so that’s a nice twist. My husband doesn’t like pork anymore, but I think my boss or SIL would love the pork dish. Happy Thursday! I love cucumber in the summer too. Very refreshing. Why has your husband stopped eating pork? Michelle @ Eat Move Balance recently posted..GPP Fitness: Great workout, great resource!! I don’t have much experience cooking Asian foods so I’m not sure how I feel about coconut milk based sauces. I tend to like whatever is spicy and flavorful. I definitely liked this recipe and would make it again. It was delicious,and even better as leftovers. I’d totally double this and make it for a dinner party. These look fantastic and I will definitely try them this coming week. Thanks so much!